This article is about the freeway in North Carolina. For the decomissioned highway in the US state of Georgia, see Interstate 485 (Georgia). Interstate 485 (I-485) is an Interstate Highway loop encircling Charlotte, North Carolina. Completion of the last segment of the highway occurred on June 5, 2015. 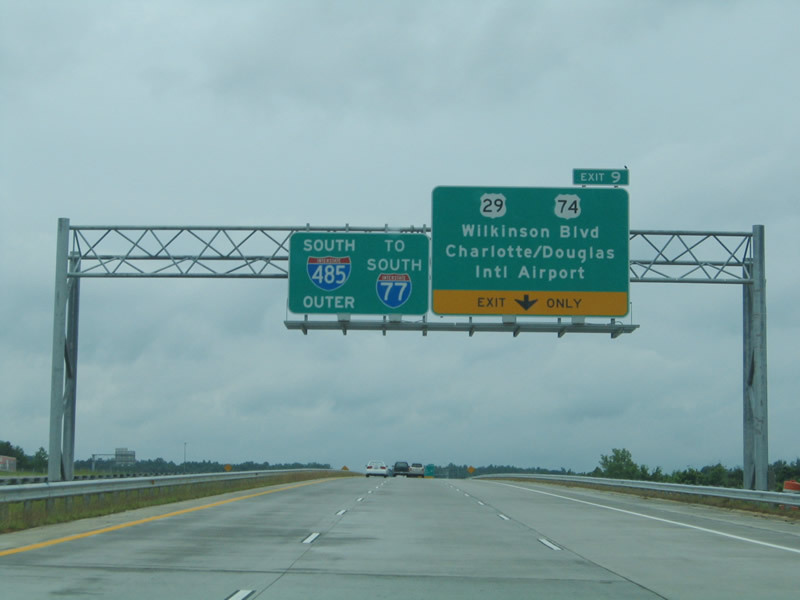 I-485 travels 67.6 miles (108.8 km) around the city of Charlotte, with mile markers begin/end at the I-77/US 21 interchange near Pineville. Lane counts vary from four to eight, while the posted speed limit throughout is 70 miles per hour (110 km/h). The beltway is further broken down into four segments: Seddon "Rusty" Goode Freeway (southwest), Craig Lawing Freeway (northwest), H. Allen Tate, Jr. Highway (northeast) and Governor James G. Martin Freeway (southeast). The southwest segment is six-lanes throughout, on concrete, and borders the Steele Creek area. Attractions in this area include the Charlotte Premium Outlets (exit 4) and Lake Wylie. There are also two exits here for the Charlotte/Douglas International Airport: exit 6 for the Air Cargo Center and exit 9 for the main terminal. The northwest segment of the beltway is six-lanes throughout, on concrete. Attractions in this area include the U.S. National Whitewater Center (exit 12), Northlake Mall (exit 21) and Mountain Island Lake. The northeast segment is eight-lanes throughout, using both concrete and asphalt, and borders Huntersville at its northernmost point. Attractions in this area include the Carolina Renaissance Festival (October–November) and Concord Mills Mall. The southeast segment is the largest segment, which goes through the towns of Mint Hill, Matthews and Pineville, as well as the notable Charlotte neighborhoods University City and Ballantyne area. Over 18 miles (29 km) of the segment is four-lane, with six/eight lane sections within the University City, Ballantyne and Pineville areas, all on asphalt. Attractions in this area include the Charlotte Motor Speedway (exit 32), PNC Music Pavilion, University of North Carolina at Charlotte (exit 33), the Mecklenburg County Sportsplex, Carolina Place Mall (exit 64B) and President James K. Polk Historic Site (exit 65B). Although the loop runs within 1.5 miles (2.4 km) of the South Carolina state line, and within 20 feet (6.1 m) of the Cabarrus County line at the Rocky River Road exit, the entire beltway is within Mecklenburg County's boundaries, and never crosses into South Carolina or any neighboring counties. I-485 is Charlotte's first "true" loop road as both I-277 and Route 4 are partial ring roads. Since Interstate 485 is a beltway, the compass orientation of the freeway is not uniform around the loop. To remedy the uniformity issue, the inner/outer orientation system was implemented and became the primary method of signing the direction of travel around the loop. Some sections of the loop are signed with additional north/south or east/west labels (depending on the general direction of travel along a particular stretch) to aid drivers familiar with compass directions. Usually when both systems are utilized on signs, the compass directional banner is placed above the number shield and the inner/outer banner is placed below. Officials originally decided to use only "north" and "south" compass directions when signing the route, but because this would be confusing with multiple "norths" and "souths", "inner" and "outer" designations were included. Although "east" and "west" signs exist, these will be phased out in favor of "inner" and "outer" designations. Traffic traveling in a clockwise direction around the city of Charlotte is on the "Inner" loop and traffic traveling in a counterclockwise direction is on the "Outer" loop. This system can be confusing, but it is logical; since traffic in the United States generally travels on the right side of the road, the clockwise traveling lanes will always be the "Inner" lanes of a loop. There are three control cities along the route: Huntersville, Matthews and Pineville. Secondary control cities, which include Spartanburg, Statesville, Greensboro and Columbia, are also listed at various interchanges for travelers that want to bypass Charlotte to other destinations, via Interstates 77 and 85. I-485 in North Carolina is split into four dedicated or memorialized stretches of freeway. Craig Lawing Freeway – Official name of the northwest section, named for Craig Lawing from mile marker 10 to 23 (approved: February 2, 2001). Governor James G. Martin Freeway – Official name of the southeast section, from mile marker 31 to 67. Named in honor of Governor James G. Martin who served North Carolina from 1985 to 1993 (approved: December 4, 1993). H. Allen Tate, Jr. Highway – Official name of the northeast section, from mile marker 23 to 31. Named after the founder of Allen Tate Realtors and was dedicated on March 27, 2015. Seddon "Rusty" Goode Freeway – Official name of the southwest section, from mile marker 0 to 10. Seddon Goode served on the transportation board in Mecklenburg County and helped bring I-485 as a reality (approved: March 7, 1997). Doctor Jay M. Robinson Freeway – Was the official name of the northeast section, from 2001-2015. Named after a former superintendent of the Charlotte-Mecklenburg Schools system. Approved on January 5, 2001, it was never signed; when this section was finally constructed in 2015, it was redesignated to honor H. Allen Tate, Jr. The first section of what became Interstate 485 was completed around 1967, connecting a newly opened section of I-85 with US 29 near the Cabarrus-Mecklenburg county line. This section became a part of Interstate 485 on May 5, 1999, the first section of the highway on the north end of the county. In 1975, planning began for the Charlotte outerbelt. On July 8, 1988, Gov. Jim Martin and state transportation secretary Seddon Goode attended a groundbreaking near US 521, marking the start of construction on the first 1.3-mile (2.1 km) section between US 521 and NC 51. Martin also announced the designation "Interstate 485" for what had previously been called the outerbelt. The section opened November 1, 1990, two months earlier than planned. Still, because of all the development in the area, the highway immediately became inadequate for the area's needs and required widening. A 2.6-mile (4.2 km), $67.2 million section of I-485 from US 521 to I-77 opened October 24, 1994. The section included a four-level interchange at I-77. On December 9, 1994, the section from NC 51 to Rea Road opened. On July 1, 1997, a $13.9 million 2-mile (3.2 km) section of I-485 opened between I-77 and NC 49, a section designated The Seddon "Rusty" Goode Jr. Freeway, named for a member of the North Carolina Board of Transportation who helped decide where I-485 would be built. On August 15, 1997, 2.3 miles (3.7 km) of I-485 opened between Rea Road and NC 16 (Providence Road). An $8.6 million 1.4-mile (2.3 km) section from NC 49 to Brown-Grier Road in the Steele Creek community opened in two stages August 26 and 27; the name of Brown-Grier Road changed to Arrowood Road when that road was extended. Seven more miles opened September 15, connecting NC 16 to U.S. 74. In May 1999, the original segment between I-85 and US 29 (N. Tryon Street) was widen and upgraded to interstate standards, officially becoming part of I-485; a few months later, on August 13, the segment was extended to NC 49 (University City Boulevard). In December 1999, the main section of I-485 continued its extension north from US 74 to Idlewild Road, adding 2.3 miles (3.7 km). In June 2000, another 3-mile (4.8 km) extension was completed, between Idlewild Road and Lawyers Road in Mint Hill, at a cost of $10.2 million. In 2003, the last 12.5 miles (20.1 km) needed to link main I-485 to its northern stub was completed, at a cost of $55.4 million. Opening in two phases, the first 7.5-mile (12.1 km) segment opened on September 3, 2003, between University City Boulevard and NC 27 (Albemarle Road); two months later, the second 5-mile (8.0 km) segment opened on November 19, between Albemarle Road and Lawyers Road. By end of 2003, I-485 was one continuous 37-mile (60 km) freeway between I-85 (near Concord) to Arrowood Road. On October 19, 2004, I-485 was widen, from four to six-lane between I-77/US 21 and Arrowood Road, and extended between Arrowood Road and I-85 (near Belmont). Completion of the $100 million 7-mile (11 km) segment is noted that it would relieve traffic along the Billy Graham Parkway and provide an alternative route to Charlotte Douglas International Airport. On December 15, 2006, a 2.3-mile (3.7 km) segment between I-85 (near Belmont) and NC 27 (Mount Holly Road) opened; signed as Future I-485, it was also dedicated as the Craig Lawing Freeway. Six months later, on May 9, 2007, another 1.5-mile (2.4 km) segment, between Mount Holly Road and NC 16 (Brookshire Boulevard) was opened. On December 4, 2008, a 5.5-mile (8.9 km) segment between Brookshire Boulevard and NC 115 (Old Statesville Road) was opened; all future signage was removed from the previous segments, with new signage showing connection between I-77, towards Statesville, and I-85, towards Spartanburg. In 2011, West Boulevard interchange (exit 6) was opened to traffic, existing previously as a graded future interchange since 2004. The final segment, from I-77 to I-85 near UNC Charlotte, had begun Right of Way Acquisition phase with contracts awarded in June 2010. The segment opened to traffic on June 5, 2015, finally completing the loop and providing a direct connection from I-77 near Huntersville to I-85 near Concord Mills Mall. Since 2003, the North Carolina Department of Transportation (NCDOT) made sure that future segments of I-485 were designed with a minimum of six travel lanes. While the first segments of I-485 were already choked by traffic, thanks to Charlotte's rapid growth, NCDOT could not immediately deal with the issue thanks to a 2000 policy that prevented the state using trust fund money, a major source of funding for new projects, to widen existing roads. Eventually, NCDOT was able to allocate new funds for a widening project, between US 521 (Johnston Road) and I-77/US 21, which was slated for construction in 2012. On November 18, 2011, NCDOT changed the plans with an extension of the widening project to Rea Road and additional space allocated for a future toll lane, between Johnston Road and I-77/US 21. Construction on the modified widening project began in 2013; at a cost of $83.3 million, the 9.2-mile (14.8 km) widening project was completed in December 2015. On January 15, 2017, the Oakdale Road interchange (exit 18) was opened to traffic, existing previously as a graded future interchange since 2008. Since November 18, 2011, NCDOT has made plans for future toll lanes along I-485. Modifying an already planned widening project between US 521 (Johnston Road) and I-77/US 21, it called on a future toll lane to be constructed as well as extending the widening project towards Rea Road. The future toll lanes, when completed would be between US 74 (Independence Boulevard) and I-77/US 21; in April 2014, the Charlotte Regional Transportation Planning Organization (CRTPO) adopted the 2040 Metropolitan Transportation Plan (MTP), which included establishing toll lanes along I-485. The first segment of the new toll lanes, between Johnston Road and I-77/US 21, were completed in December 2015, but were not opened. The new un-open lanes along I-485 became controversial and discussions were made about making it an HOV lane, or at least temporally; however local and state officials said that could not be done and would cost more for just temporary use of the lanes. At a cost of $202.9 million, the 16.6-mile (26.7 km) Interstate 485 Express Lanes project will establish new toll lanes along its entire planned route. It will also include the following improvements: Adding additional general purpose lanes between Providence Road and Rea Road, extend auxiliary lanes between Independence Boulevard and East Johns Street, establish dedicated connectors from the Express Lanes to Johnston Road (eastbound only) and Westinghouse Boulevard (westbound only) and incorporates the existing planned project of adding a new interchange at Weddington Road. Tolls would be collected using an electronic toll collection (ETC) system; drivers will need to have the NC Quick Pass, or other interoperable transponder, or will be billed by mail with a higher rate. Construction is slated to begin "tentatively" in Summer 2018. Mile marker numbering along the loop freeway goes in a clockwise direction, beginning and ending at I-77/US 21, in south Charlotte. The entire route is in Mecklenburg County. ^ "Google Maps". Retrieved January 25, 2011. ^ "NCDOT Announces Opening Date for Final Segment of I-485" (Press release). North Carolina Department of Transportation. May 13, 2015. Retrieved May 14, 2015. ^ "NCDOT Implementing 70 MPH Speed Limit on I-485 Outer Loop" (Press release). North Carolina Department of Transportation. May 14, 2015. Retrieved May 14, 2015. ^ "State has new way to identify location on I-485". Charlotte, NC: WSOC-TV. March 7, 2005. Retrieved December 1, 2006. ^ a b c d "North Carolina Memorial Highways and other Named Facilities" (PDF). North Carolina Department of Transportation. Archived from the original (PDF) on December 29, 2012. Retrieved March 27, 2015. ^ a b Sorensen, Andrew (March 27, 2015). "Final Section of I-485 Officially Named After H. Allen Tate, Jr". Charlotte, NC: Time Warner Cable News. Retrieved March 27, 2015. ^ "Final Segment of I-485 Named for Entrepreneur and Longtime Transportation Advocate Allen Tate" (Press release). North Carolina Department of Transportation. March 27, 2015. Retrieved March 27, 2015. ^ O'Brien, Gary (August 28, 1996). "Clearing the Way". 'The Charlotte Observer. p. 2M. ^ Lyttle, Steve (June 1, 2013). "2 Meck bridges among NC's 'substandard". The Charlotte Observer. p. 1B. ^ a b Whitacre, Dianne (May 6, 1999). "Stretch of Road Part of a Larger Step". The Charlotte Observer. p. 1C. ^ a b Whitacre, Dianne (November 20, 2003). "I-485 Arc Takes Shape to Bypass Charlotte". The Charlotte Observer. p. 1A. ^ Curry, Kathleen (July 9, 1988). "Outerbelt Dubbed I-485: Construction on Road Project Officially Under Way". The Charlotte Observer. p. 1B. ^ Whitacre, Dianne (November 11, 1990). "I-485's Opening Unclogs Traffic at Intersection, Not in Heart of Pineville". The Charlotte Observer. p. 4 (Mecklenburg Neighbors). ^ a b Whitacre, Dianne (May 13, 2003). "Rules Delay Widening Busiest I-485 Stretch". The Charlotte Observer. p. 1A. ^ Norwood, Allen (October 25, 1994). "Open for Business: Ribbon Cut on Newest I-485 Section". The Charlotte Observer. p. 1A. ^ Norwood, Allen (December 2, 1994). "Bracing As the Outerbelt Advances". The Charlotte Observer. p. 1B. ^ Whitacre, Dianne (July 2, 1997). "Charlotte's Outerbelt Adds Link to NC 49". The Charlotte Observer. p. 2C. ^ Horan, Jack & LaPolla, Joie (August 15, 1997). "A Welcome Link: New Section of Outerbelt a Big Deal for Union County". The Charlotte Observer. p. 1C. ^ Whitacre, Dianne (August 28, 1998). "1.4-Mile Stretch of I-485 Opens from NC 49 to Steele Creek". The Charlotte Observer. p. 1C. ^ Gomlak, Norman; LaPolla, Joie (September 14, 1997). "New I-485 Link: Life in the Faster Lane". The Charlotte Observer. p. 4U. ^ Whitacre, Dianne (August 13, 1999). "I-485 Leg Opens Today, But Will Traffic Come?". The Charlotte Observer. p. 5C. ^ Whitacre, Dianne (December 16, 1999). "Filling in the Belt's Gaps". The Charlotte Observer. p. 1C. ^ Whitacre, Dianne (June 7, 2000). "I-485 Reaches Mint Hill". The Charlotte Observer. p. 1A. ^ Whitacre, Dianne (September 3, 2003). "Opening Today Adds 7.5 Miles to Eastern I-485". The Charlotte Observer. p. 1B. ^ Whitacre, Dianne (October 20, 2004). "Outerbelt Section Opens to Cheers, Parade of Cars". The Charlotte Observer. p. 2B. ^ Rubin, Richard (December 16, 2006). "Outerbelt Giveth, and Taketh Away". The Charlotte Observer. p. 1B. ^ Harrison, Steve (December 3, 2008). "Newest I-485 Section to Open". The Charlotte Observer. p. 1B. ^ "$1.2 Million Contract Awarded to Complete I-485 Interchange in Mecklenburg County" (Press release). North Carolina Department of Transportation. September 22, 2010. Retrieved March 26, 2017. ^ "I-485 Charlotte Outer Loop". North Carolina Department of Transportation. Archived from the original on June 21, 2016. Retrieved September 19, 2011. ^ "Charlotte company awarded contract for I-485 completion". Charlotte, NC: WCNC-TV. June 3, 2010. Retrieved September 19, 2011. ^ a b "Project R-4902". North Carolina Department of Transportation. Retrieved October 31, 2011. ^ a b "NC considers adding toll lane to I-485". The Charlotte Observer. Retrieved November 18, 2011. ^ Penland, Brittany (December 2, 2012). "Ballantyne widening of I-485 starts in new year". The Charlotte Observer. p. 4B. ^ "Oakdale/I-485 interchange open for drivers ahead of Tuesday commute". Charlotte, NC: WBTV. January 18, 2017. Retrieved March 26, 2017. ^ a b "NCDOT: I-485 Express Lanes". North Carolina Department of Transportation. Retrieved November 21, 2017. ^ St. Onge, Peter (January 23, 2015). "An open mind on closed I-485 lane". The Charlotte Observer. Retrieved November 21, 2017. ^ Harrison, Steve (January 5, 2016). "Vote signals Charlotte City Council support for toll lanes". The Charlotte Observer. Retrieved November 21, 2017. ^ "SPOT ID: H128073" (PDF). North Carolina Department of Transportation. May 29, 2014. Retrieved November 21, 2017. ^ "I-5507 / R-0211EC / U-4714AB Project Synopsis" (PDF). North Carolina Department of Transportation. Retrieved November 21, 2017. ^ Google (July 20, 2012). "Overview map of I-485 (Western Half)" (Map). Google Maps. Google. Retrieved July 20, 2012. ^ Sullivan, Karen. "Oakdale Road interchange takes shape on I-485". The Charlotte Observer. Retrieved November 1, 2015. This page was last edited on 22 January 2019, at 19:22 (UTC).